You can expect the modern bride to adhere to the time-honored “something old, something new, something borrowed, something blue” template for her wedding without bothering to know about its origins (hint: it’s from the Victorian era). 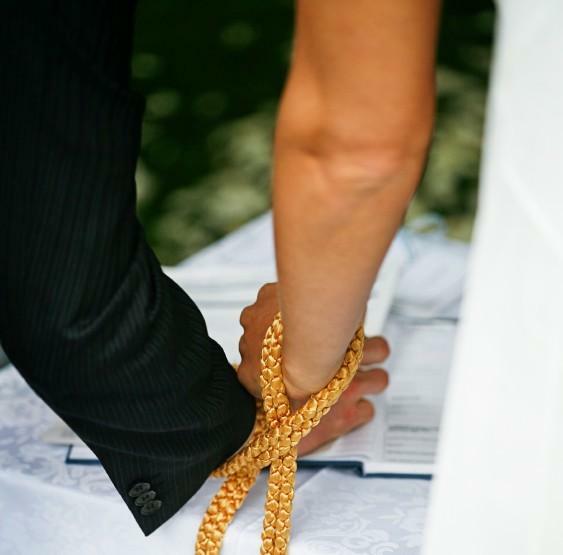 Traditions, after all, play a big role in any nuptials as they help to shape the newly-married couple’s way of life. However, we are seeing more and more contemporary weddings incorporating others’ customs into theirs for reasons both practical and sentimental. For instance, the recently concluded reality television show, The Bachelorette featured the pre-Medieval wedding custom of hand-fasting, which involves the couple’s clasped hands being bound by a length of ribbon or fabric. Many viewers found the gesture romantic and meaningful, which emphasized the nuptial expression of “tying the knot”. Little customs like this lend a highly personal touch to any wedding, and if you are looking to integrate some into yours, you may want to consider these five most romantic wedding customs culled from other cultures. What could be more romantic than a groom serenading his future wife right before the wedding ceremonies? Indeed, the Italians really know how to up the ante on the amore when it comes to wedding customs. A party, aptly called, The Serenade, is held outside the future bride’s home by the groom and his friends. She may or may not be home, and she may or may not be aware of the presence of a party at her house. However, the groom is expected to sing love songs and serenade her until she makes an appearance. Molto romantico! While many modern weddings have easily adapted the toast to the bride and groom in their receptions, here’s a significant twist borrowed from the Armenian tradition: say “May you grow old on one pillow” to the newly married couple. It is believed to reinforce the couple’s togetherness and physical closeness, and never straying from each others’ embrace in the course of their marriage. Many modern couples have featured this phrase in their invitations, programs, souvenirs, and even etched on their wedding bands! The modern bride is expected to march down the aisle alone or with her parents, with the groom waiting for her at the altar. In Sweden, however, the tradition is for the groom and bride to step into the church together and head down to the altar as a couple. For a more contemporary (and unexpectedly romantic!) twist, the groom might want to meet the bride half-way as she walks down the aisle, as if he cannot wait for her to be his wife at last. During the reception, guests usually make little speeches about what they expect and wish for the bride and groom. For the Dutch, a more creative way is to have a small tree with branches placed either at the newlyweds’ table, or at the guests’ tables (miniature, ornamental versions will do in lieu of real trees). They can write their wishes on the leaves of the branches for the bride and groom to read after the reception. More practical than romantic but nevertheless full of meaning, the Polish have a wedding custom of the parents’ giving the newlyweds bread and salt at the reception. The bread stands for prosperity while the salt represents possible hardships the couple may encounter in their new life together. When presented together, however, it is to express the wish that they will never go hungry and that they will face all obstacles as a couple.